Welding—or the process of repairing or fusing together pieces of metal—is a process that can be traced back to the Middle Ages. During this time, blacksmiths welded various types of iron tools and weapons using extreme heat, hammering, and cooling. Welding has come a long way since these ancient times. It’s stronger, quicker, and safer, and can now be done using robots. The efficiency, speed, and quality of robotic welding is something we at Fort Miller Fab3 know all too well—it is the center of our excellence. Robotic arc welding allows us to weld a high volume of different-sized metals, quickly, efficiently, and precisely. Contact us for all your metal fabrication needs! To learn more about the advantages of robotic welding services, read on! Unlike laborers, machines don’t require breaks or time off. They can work 24 hours a day, and so long as you keep them maintained, they can seemingly do that without end. Naturally, this means that parts and materials move through the system much faster, which can potentially increase production as well as save time. Additionally, whereas manual welders have to swap out multiple jigs for a job, robotic arms don’t require the same tool changes. They can, therefore, cut production time. The introduction of robotic welding not only revolutionized the amount of time it takes to weld, but it has also improved efficiency through conservation. For example, even the most talented welder in the business makes mistakes. Over time these mistakes add up, leading to wasted materials. With automated welders, you repeatedly get the same quality weld in the same spot, over and over again. And because everything is monitored and regulated using computers, the supervisor ultimately has complete control of the robot’s material and energy usage. Skilled welders can be difficult to find, train, and retain. And on top of all of this, they can be expensive. 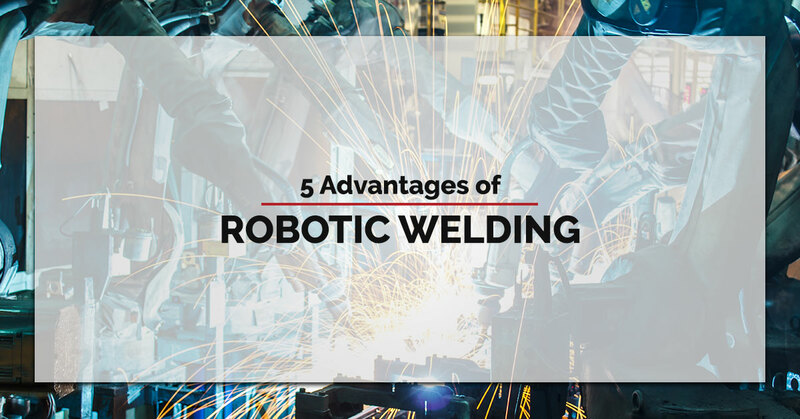 Robotic welding services are eliminating this need for specialized personnel and are instead creating a situation where one highly skilled welder can supervise several automated cells, therefore cutting the cost of labor. Similar to how the automation of welding conserves material, it can also lead to less cleanup. The precision of robotic arms leads to less weld spattering and neater seams, which in the long term means you’ll have less of a mess to clean up. Welding is a notoriously dangerous and taxing job. Among the many safety risks are dangerous fume inhalation, electric shock, and eye damage. Robotic welders mitigate such risks, creating a safer work environment. This also saves money by lowering worker’s compensation and insurance costs. Though there is still certainly something to be said about the craft and excellence of a skilled manual welder, robotic welders offer a great return on investment and can be the place to go for consistent, precise, and high-volume weldments. If you have a project that you think is fit for our robotic arc welder, Fort Miller Fab3 would love to hear from you. Contact us today to learn more!